According to the instructions of President of the Republic of Azerbaijan, Supreme Commander-in-Chief of the Armed Forces Ilham Aliyev, work in the field of equipment, provision and improvement of the social conditions of military personnel continues in all military units of the Azerbaijani Army. 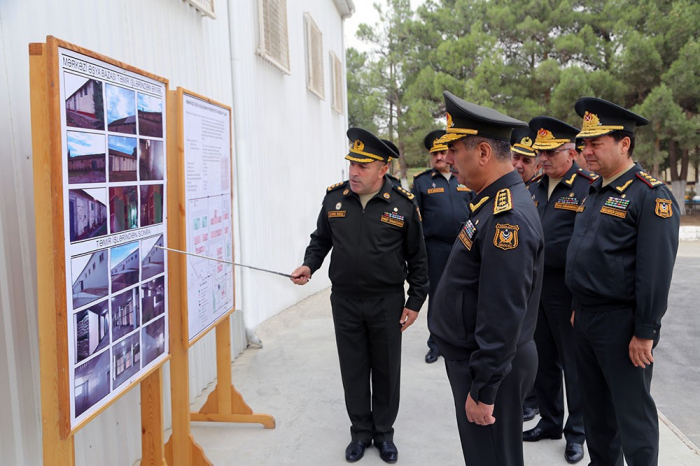 Minister of Defense, Colonel General Zakir Hasanov and the leadership of the Ministry took part in the opening of the Central Military Veterinary Laboratory of the Ministry of Defense. The laboratory was built under the activities carried out by the President of the Republic of Azerbaijan in the field of food safety and the requirements of the regulatory acts in force in this area. The laboratory, equipped with the most modern technical equipment carry out food safety control following state standards, as well as requirements of regulatory technical and other guidance documents. The laboratory researches food products of plant, animal and inorganic origin, delivered to the military personnel of the Azerbaijan Army. Physico-chemical, bacteriological, radiological and toxicological researches of food products are carried out in specially designated premises. Their suitability and compliance with quality standards are also monitored here. The minister was informed that all the necessary conditions for regular activity and rest of the personnel were created here. Then Zakir Hasanov viewed the storage facilities built on the territory of the Central clothing warehouse and the Central food supply depot. It should be pointed out that such facilities, which are designed to provide and equip military personnel fully, also function in the frontline zone. The defense minister viewed the pattern of food and clothing property intended for the military personnel of the Azerbaijan Army. The minister having inquired about the convenience, quality and stability of the products demonstrated here, as well as all types of military uniforms, gave relevant instructions.